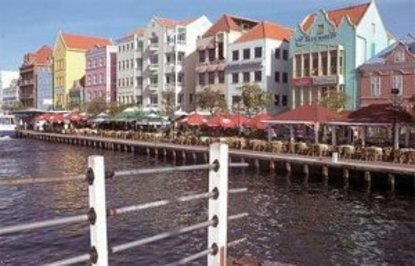 The Super inclusive Breezes Curacao is approximately 20 minutes from the airport/ five minutes from downtown Willemstad and two minutes from the Seaquarium. The spacious resort offers a 15000 feet/ white sand beach with a private lagoon for swimming. When night falls on the island/ the hotel lights up with music and dance. Four bars dot the grounds/including the Piano-Pelican Bar and the Hurricane Disco Bar which only closes when all the guests leave. For those who love to sing/karaoke can be found in the Piano Bar a few times a week. For those itching to roll the dice/the hotel boasts the largest casino on the island. Transfers from the airport included. Upon airport arrival please go to the SuperClubs desk for your transportation to the resort. Spring Break restrictions apply at this hotel. During March and April minimum check in age is 21 years old unless accompanied by a parent or guardian. Hotel needs documentation to confirm the reservation. Please contact the hotel at 018004678737.